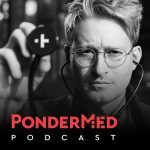 During my six months working in the paediatric emergency department, I’ve noticed that the vast majority of young children are petrified of needles. It increases the time prior to administration of treatment (like IV antibiotics). It means subjecting the child to another dose of pain during the second attempt. That prospect could make them agitated and even more difficult to cannulate the second time. Repeated failures could mean a procedural sedation or intraossesous access is required. Potentially risky stuff. It’s time-consuming for staff. This is expensive and potentially dangerous as staff are unable to be elsewhere in a busy department. Particularly harrowing experiences might lead to crippling needle phobia or PTSD. This could be problematic for future hospital visits, particularly if the child turns out to have a chronic illness like diabetes..
During intravenous cannulation (or any other painful procedure in the ED), the gold standard includes the services of a play specialist working together with a parent +/- an iPad/handheld electronic device. However, if the child catches a glimpse of the needle, it doesn’t matter how expertly the child is being distracted – it tends to be game over and brute force is usually required. 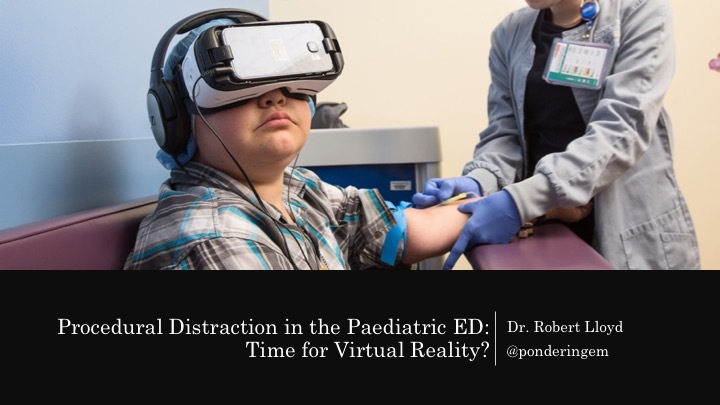 Experiencing this happen on repeat for 6 months has led me to my lightbulb moment: Virtual reality as a means of procedural distraction in the paediatric ED. Interactive virtual reality experience delivered via Samsung Gear VR head-mounted-display and earphones. Standard of care. This would include the presence of a parent, play specialist, and iPad. 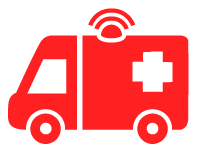 We are also considering a concurrent qualitative study of patient experiences of IV cannulation with and without VR. Uman, L. S., Chambers, C. T., McGrath, P. J., & Kisely, S. (2008). A systematic review of randomized controlled trials examining psychological interventions for needle-related procedural pain and distress in children and adolescents: An abbreviated Cochrane review. Journal of Pediatric Psychology, 33, 842–854. Oliveira NCAC, Gaspardo CM, Linhares MBM. Pain and distress outcomes in infants and children: a systematic review. Braz J Med Biol Res. 2017 Jul 3;50(7):e5984. Miller K, Tan X, Hobson AD, Khan A, Ziviani J, OʼBrien E, Barua K, McBride CA, Kimble RM. 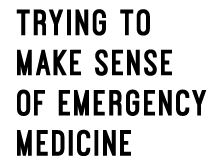 A Prospective Randomized Controlled Trial of Nonpharmacological Pain Management During Intravenous Cannulation in a Pediatric Emergency Department: Pediatric Emergency Care. July 2016 – Volume 32 – Issue 7 – p 444–451. Moadad N, Kozman K, Shahine R, Ohanian S, Badr LK.Distraction Using the BUZZY for Children During an IV Insertion. J Pediatr Nurs. 2016 Jan-Feb;31(1):64-72. Gold, J. I., Kim, S. H., Kant, A. J., Joseph, M. H., & Rizzo, A. S. (2006). Effectiveness of virtual reality for paediatric pain distraction during IV placement. CyberPsychology and Behavior, 9, 207–212. Gold J. I., Reger G., & Rizzo A. A., et al. Virtual reality in outpatient phlebotomy: evaluating pediatric pain distraction during blood draw. Presented at the 10th Annual Poster Session of the Saban Research Institute. Los Angeles: Children’s Hospital Los Angeles; The Journal of Pain 6(3), Supplement, Page S57, March 2005. Hua, Y., Qiu, R., Yao, W. Y., Zhang, Q., & Chen, X. L. (2015). 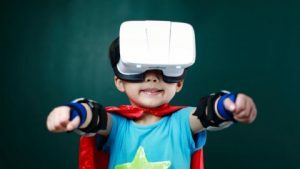 The effect of virtual reality distraction on pain relief during dressing changes in children with chronic wounds on lower limbs. Pain Management Nursing, 16, 685–691. Hoffman, H. G., Patterson, D. R., Seibel, E., Soltani, M., Jewett-Leahy, L., & Sharar, S. R. (2008). Virtual reality pain control during burn wound debridement in the hydrotank. The Clinical Journal of Pain, 24, 299–304. Das, D. A., Grimmer, K. A., Sparnon, A. L., McRae, S. E., & Thomas, B. H. (2005). 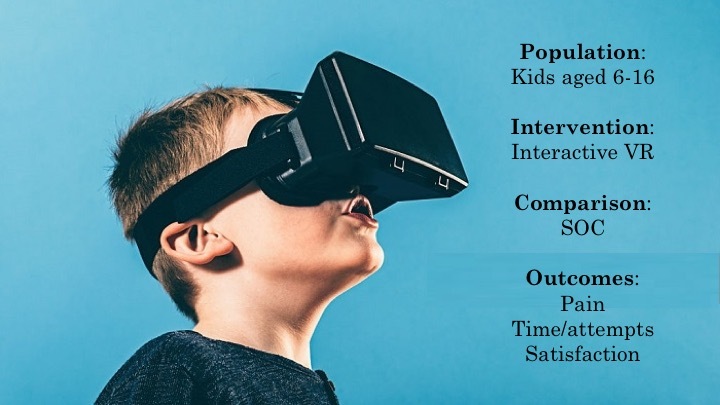 The efficacy of playing a virtual reality game in modulating pain for children with acute burn injuries: a randomized controlled trial [ISRCTN87413556]. BMC Pediatrics, 5, 1. Please don’t hesitate to get in contact for more information about the project. Email me at ponderingem@gmail.com.